Well, when we are dealing with bands that mix the aggressiveness and harshness of Black Metal with Death Metal thundering features, it really can be a trial. Bands as BEHEMOTH and HATE created a pattern that is difficult to beat. But there are times when the bands try something different, searching for the beginning of this fusion, and to be honest: the results for this quest is truly frustrating, because it's a territory extremely explored and has nothing to offer. Who done this kind of sound back on the end of the 80s or in the beginning of the 90s are the ancients, and who tries to sound as them did are clones. 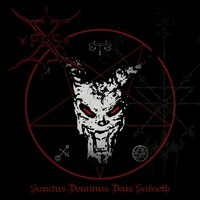 And the Italian trio XPUS really disappoints us on "Sanctus Dominus Deus Sabaoth". It's nothing that BEHERIT, BLASPHEMY or MYSTIFIER didn't do before, without the talent, just a band that will follow others. Sorry, but we already know albums as "Gods of War", "Drowning Down the Moon" or "Goetia", and they were done in a better way than we hear on "Sanctus Dominus Deus Sabaoth". Guttural vocals, guitars alternating fast riffs and slower ones, that disgusting raw and filthy sound we heard many times on the past… Sorry, but I couldn't find something that could justify the listening of this album. The sound quality is raw and truly bitter. Of course under all this nasty sound we can detect the worry of creating a sound quality that could be understood. The quality is really fine for the style, but this isn't enough to save the album. The lack of personality is truly strong! On their nine songs, the same impression is present; there isn't a single moment that really could save the album. Besides that, "Desecration of the Image of God", "LHP" and maybe "The Great Worm of the Third Circle" shows clearly that these guys are talented, that they really can offer more that we can hear on this album. You can have a nasty music, and I'm not telling the band to try to sound as BEHEMOTH, HATE or any other band, but they don't need to create their songs collecting all the musical clichés that are really exhausted. Give life to your work, create songs of your own, and please, turn the goddamn sound device that you use to hear music before start to compose and record your songs. That's the spirit that guided those ancients!